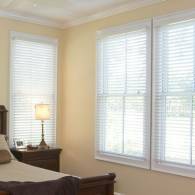 Magnolia Blinds & More, Inc. are the Hattiesburg blinds, shutters and custom window treatment specialists covering the Pine Belt. Custom window treatments can do more, in less time, to transform an ordinary room into a welcome expression of your personality than anything we know. You can make careful, unhurried decisions about the custom window treatments that are right for you under exact lighting conditions all within the comfort of your home or business. Have you just purchased a new home? Do you want to redecorate your existing home, or decorate your business with a custom window treatment? Please allow Magnolia Blinds & More, Inc. the opportunity to provide custom window treatments for you or your place of business. We offer wood and faux wood blinds, mini blinds, pleated shades, roman shades, roller shades, vinyl and wood shutters, woven woods, cellular shades and vertical blinds in Hattiesburg. We use high quality Skandia products. If you are looking for blinds and shutters in the Pine Belt then please call (601) 544-7470 or complete our online request form. With so many styles, materials, and product choices available, how can you be sure that the window treatments you select are functional and fashionable? Let our experts help you to select the best option to fit your specific needs and tastes. Why Choose Magnolia Blinds & More, Inc.? 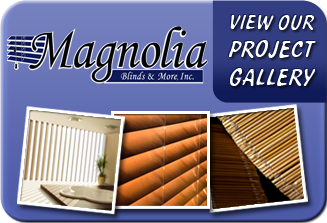 Magnolia Blinds & More, Inc.